This hotel enjoys a great seafront setting in Jounieh, overlooking the bay and the mesmerising Mediterranean Sea. The hotel is located close to the banking and business centres of Jounieh, as well as shopping, dinning and entertainment venues. Guests can explore the delights that the area has to offer, or choose to enjoy a host of activities nearby. This wonderful hotel enjoys an attractive architectural style, welcoming guests with grace and charm. The interior is tastefully designed, enjoying a simplistic style in which to completely unwind at the end of the day. This charming hotel offers guests a wide range of excellent facilities, meeting the needs of every type of traveller. 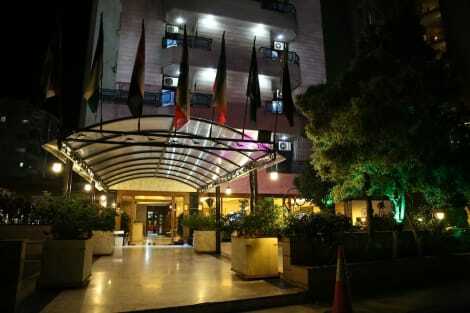 Located in Jounieh, Vista Del Mar Hotel is within a 5-minute drive of Fouad Chehab Stadium and Keserwan Medical Center. This hotel is 6.8 mi (10.9 km) from Jeita Grotto and 11.6 mi (18.7 km) from Le Mall Sin El Fil.